Leongatha Medieval Society :: View topic - Bernard Cornwell - new book AGINCOURT! Bernard Cornwell - new book AGINCOURT! Posted: Thu Apr 17, 2008 3:18 pm Post subject: Bernard Cornwell - new book AGINCOURT! well not quite a review yet, BUT if any of you have read Bernard Cornwells, Grail Quests series based on the exploits of Thomas of Hookton in the hundred years war, then you won't want to miss Bernards new book due out this year.... Agincourt.... OHHHHH YEAH! so when they make the movie Len, i know 2 companies ripe for the front lines..... an army with Lions on the left flank and Griffins on the right is sure to taste victory! I've already cast Len as Will Skeat. For those who speak the tongue. Hey Dean, would Len be the Will Skeat before he copped a sword blow to the head or the one afterwards? The thing I like about Bernard Cornwell's books is the fact that they're pretty well historically correct, particularly the larger battles, etc. He actually tells you at the end of each book where he has taken some liberties with the facts. I think he overstates the capabilities of some of the archers though. Thomas of Hookton was supposed to be able to shoot an arrow through a ladies braclet at 100 yards, or shoot an arrow through an open visor (with the wearing moving) at long range too. Maybe it could be done, but I find it hard to imagine. I suppose when you take into consideration the capabilities of some modern archers like say, Howard Hill for example, it just might have been possible. It makes a good read anyhow. Well, if the idea of waiting until October shrivels your testicles try this one out! You'll get your fix of Agincourt for sure with this, I personally recommend it. As awesome as Cornwell's grail series is, Juliet Barker's book is as researched as it possibly can be and takes no liberties she doesn't tell you about. It's written as an historical account including everything from Henry's upbringing, his take over from his piss-ant of a king father, his years of planning, the campaign and finally the battle. Even though it's written this way it actually reads like a novel and I couldn't put it down. Countless times I found myself saying "Jesus the s--t they pulled on each other is insane!" And if you don't think my opinion counts for jack squat... Check this out! Our boy Cornwell agrees with me ahahaha! Swords speak louder than words. I nominate Llwyd for Father Hobb! May the saints make safe your path through life. Blessed are the humble, for they shall inherit all cake!!!!! and in the end, isnt that what really matters. 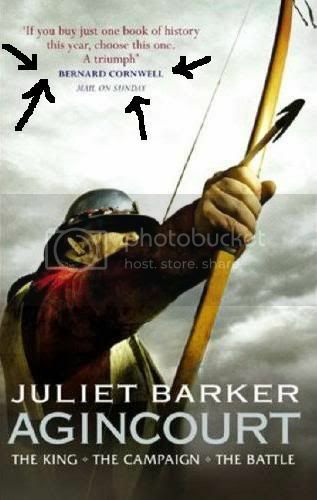 I think it was more to do with where you keep your extra bowstring (For those who don't get this read the book). Part of my long term desire is to have us all partaking in a film. This is why Anthony, Morgan and Myself et al are currently making what I dare say will be a very nice 3 minute promo film. In fact with the footage we are getting we will be able to do one for Warbow, LMS/BG's and one for general trad. archery. Anything we want really. We have a soundtrack we have some great footage. What we need now is co-operation from everyone when we do specific filming days. Coming soon will be a filming day down Geelong way and we are going to want everyone that can to be on board. It will be a promo Dvd/you-tube thing that will blow peoples socks off and show to studio's, agents etc. Nothing speaks louder than imagery and this is looking cool already. By the way Len, my bookcase is overflowing with your books! Amazing detail.. perhaps for the weak at heart, too vivid in some places. His epilogue clearly explains what is and isnt fiction and where authors poetic license prevails. Which I mention here, is only very small. If you want to feel the life of an archer and craziness of war and the heartbeats of Agincourt then this is a truly an amazing must read.